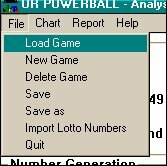 After running the program, choose LOAD GAME from the FILE menu, and look for your Lotto game. Most of the game files included with the program start with the two-digit state or province names. Multi-state lotto games begin with the word MULTI, as in "MULTI Powerball". Most states participate in one or more of the multi-state games, so look for your game there if you don't find it under your state name. If you see your game on the list, choose it and push the OPEN button. Loading the game will take a few seconds. There will be a sample database from your game, that appears in the upper right corner of the screen. If you found your game and loaded it successfully, skip the next two paragraphs. If your game was not on the list, you will need to create a game file for your particular lotto game. In this case, choose NEW GAME from the file menu, and enter the particulars of your game on the form that appears on the screen. (Click on the HELP button that appears on the form for more help.) You will have a chance to give your game a name, and to specify the number of digits and the number range of the lotto or keno game. The second and third set of numbers referred to on this screen are for games with powerballs or other game features involving multiple number sets. Leave these set to 0 digits if your game doesn't require them. When you first create a new game, you will have no database of past numbers to work with. This is OK. You can play any system without the word history in the name right now (Typical Delta, for example.) Or you can make a small database by clicking on ADD LATEST NUMBER (upper right side of the screen), and entering the last few winning numbers from your game. Again, look for the HELP button on the screen that appears, if you need additional help. Set LOOSENESS between 5 or 15, and LOOKBACK to at least 25, if you have this much history. If you don't have this many drawings stored, then set Lookback as high as you can, and Looseness to 25 or 50 instead. Choose a system for picking numbers where it says Picks are based on. After finishing all these steps, choose SAVE from the FILE menu to permanently save your game. The easiest way to get a number you can play is to click on PICK NEW NUMBERS. A set of new numbers will be chosen for the Generated Numbers box and a new number will appear in the LOTTO NUMBER box. Another way to get a number is to press CHOOSE. This button picks a number from the Generated Numbers list, without generating any new ones. You could also choose a number directly from the Generated Numbers screen. Every time you press the PICK NEW NUMBERS button, a new set of 100 numbers (along with Delta numbers in brackets) is created here, based on the settings you have chosen. So, you do not need to press CHOOSE to get a number - you can instead look through the list here, and pick one or several numbers to play. 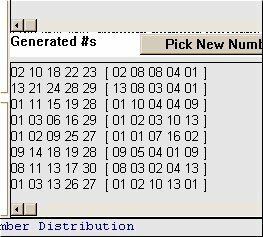 Analysis Lotto picks 100 numbers each time in order to develop statistical profiles of the numbers it chooses. One of the optimum numbers from the list is then chosen, and appears in the Lotto Number box. Each time a new winning lotto number is announced, you should enter it into the database (by clicking on ADD LATEST NUMBER) and then push PICK NEW NUMBERS to choose 100 new numbers that are calculated based on the latest winning numbers. How are those numbers chosen? Which system is used to calculate likely winners? It turns out that you have a lot of choices, and a lot of control over how the program works. There are also charts to help you see patterns and trends in winning numbers, and to help you choose the best strategy for playing. Analysis Lotto is not a wheeling, or minimum cover system. You will find that this program makes a good complement to this strategy, however. If desired, you can easily choose numbers from the Generated Numbers list to work with your wheeling system.